She got to sit up front in his police car — but she wasn't too impressed. An owl was trying to navigate her way through rush hour in Maryland one morning when she got hit by a car — and ended up injured and unable to move, right in the middle of traffic. 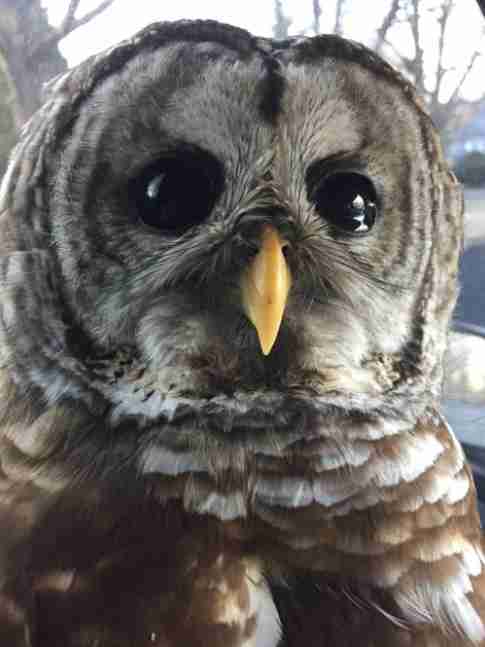 Many morning commuters spotted the distressed owl and called the police, who quickly responded to the very strange call. Corporal Michael Lathroum of the Maryland Natural Resources Police heard the call on his radio and happened to be just three minutes away, so he headed over to where the owl had been spotted. 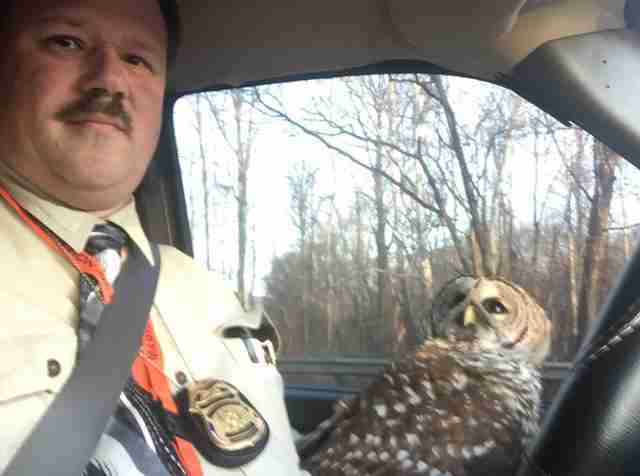 The officer also happened to be experienced in handling birds, so he was the perfect person to help the poor, confused owl. … and seemed incredibly confused as to why she was suddenly being held in a police car. The owl was very feisty as she waited with the officer in his car, but luckily Corporal Lathroum has a ton of experience with birds, and wasn’t fazed at all. 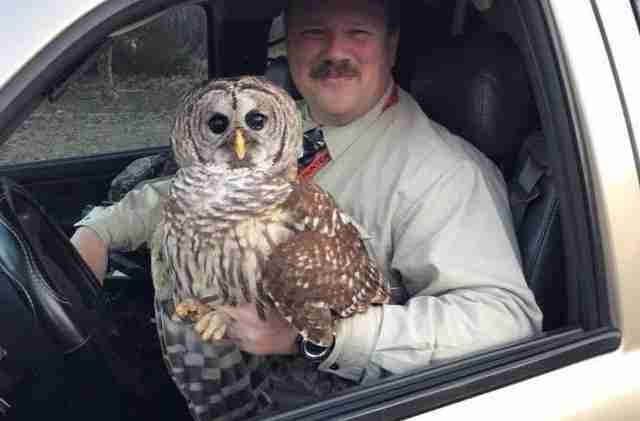 Thankfully, the owl didn’t have to wait in the officer’s car for long, and she was soon transported to Frisky's Wildlife and Primate Sanctuary. Staff at the sanctuary evaluated the owl and determined that she would make a full recovery, and by the next day she was clearly already feeling much better. 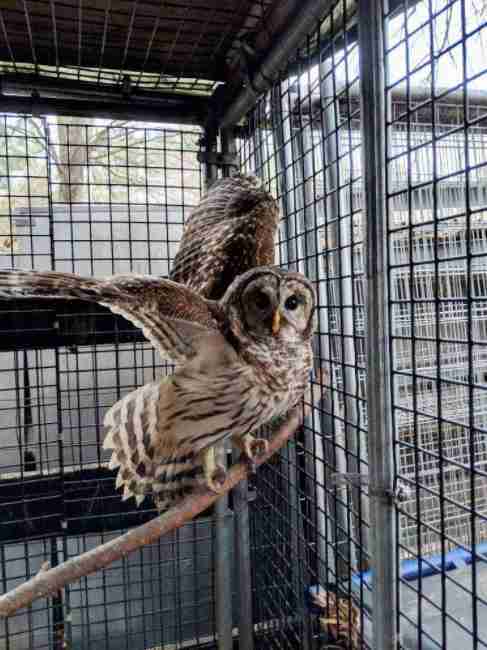 “The owl is being cared for and is expected to be released this spring,” a spokesperson for the Maryland Natural Resources Police said. If you'd like to help other injured animals, you can donate to Frisky's Wildlife and Primate Sanctuary.